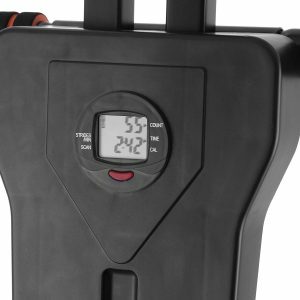 Black Vevor Vertical Climber and Stepper is an April 2017 release fitness unit for both cardiovascular/aerobic training as part of a decent total body low-impact workout. It will raise your heart rate nicely, help you burn fat and calories, lose weight or strengthen and tone your lower and upper body and abdominal muscles. People of different fitness levels and body types and height can use this vertical climber with ease, as the height is conveniently adjustable as well. You will be targeting not just your lower body muscles but also your arms- triceps and biceps and abdominals with this great vertical climber. But how much of each will rely on the intensity of your workout. Vevor Vertical Climber weighs 30 pounds with a max weight capacity of 440 pounds and measures 37 x 28 x 70 inches as assembled. It is fairly compact in size, has a small footprint both when you store it or when you work out. With a foldable design you can relocate and store it wherever you want, you can simply lean it against a wall. It includes a convenient digital display panel that shows the calories burned, strides per minute, count of steps, time exercised and scan to move between these indicators automatically. You can keep an eye on these useful indicators and stay motivated. It gives you the chance to really get the best out of your workout, by letting you push as hard as you want. You will be moving your legs and arms (by holding the upper moving handles) up and down continuously and as many reps as you can handle. You’re better off doing a little longer each day, add 30 seconds or one minute every day- simply push yourself a bit more than you did previously. You can just go at a slower speed and hold onto the lower static handles for an easier workout or to get only your legs involved. You’ll need to push yourself harder if you want the benefits of a total body exercise. It will feel safe on its sturdy steel construction and can hold onto its isometric anti-slip handles and the foot pedals are nicely textured to avoid slipping. Vevor runs rather smoothly and quietly, without disturbing others in the house or your music or TV show. It feels as solid and robust as the more expensive vertical climbers, it folds up easily, offers a great alternative to a home exercise bike and we think is actually more beneficial as it works your thighs properly. It is a much more affordable alternative to the well-known popular Maxi Climber, offering similar benefits with a similar design. 440 lb. user weight capacity is actually much more than what is on offer by Conquer and Maxi Climber. So if you’re short on space, don’t want to spend too much money on a decent treadmill or exercise bike, and want a great low impact workout with better results, then this one appears to be a good choice. In the box, you will find the vertical climber, a user manual with instructions and a small tool kit for assembly.